Ocular surface squamous neoplasia: Are we calling a spade a spade? Proposed by Lee and Hirst, the phrase ocular surface squamous neoplasia (OSSN) includes the clinical continuum of mild, moderate, and severe dysplasia, carcinoma in situ, and invasive squamous cell carcinoma (SCC). It is important to understand that dysplasia and carcinoma in situ, together constituting conjunctival intraepithelial neoplasia (CIN), are premalignant by definition, and SCC is malignant., Despite OSSN being one of the most common premalignant and malignant lesions of the ocular surface, confusion prevails regarding its basic nomenclature. Margo emphasizes that the term OSSN is conceptually friendly, but can be clinically perilous. Misinterpretation of the term OSSN has led to inaccurate classification of the conjunctival epithelial tumors in the literature. Suboptimal clinico-histopathologic correlation in many published studies limits our deep understanding of the logic behind the management, subsequent outcome, and the prognostic factors for local tumor recurrence and metastasis. The eighth edition of the American Joint Committee on Cancer (AJCC) Staging Manual continues to recognize CIN and SCC as in the seventh edition and does not use the term OSSN [Table 1]. AJCC 8 has widened the definition of each stage, incorporating elements that are difficult to clinically assess. Thus, AJCC staging is subject to misinterpretation by a clinician. For example, AJCC 8 describes T1 as “tumor <5 mm in greatest dimension that invades through the conjunctival basement membrane without the invasion of adjacent structures,” which implies that a biopsy be performed if required to confirm clinically indiscernible invasion, whereas a clinician may classify a tumor ≤5 mm with corneal or scleral invasion inaccurately as T1 just because it conforms to the size. This may lead to inappropriate selection of cases to a specific mode of treatment. It is important for a clinician managing OSSN to be familiar with the rules that govern the classification, which are elaborated in the AJCC Cancer Staging Manual. There is a due emphasis in AJCC 8 that a histopathologic tissue diagnosis is needed for accurate staging. 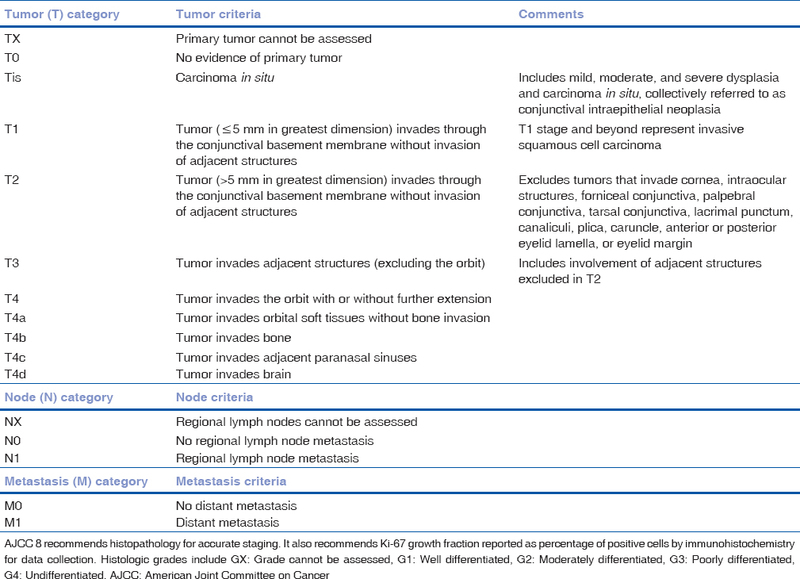 It may not be logical to use this classification when the tumor is primarily managed by nonsurgical measures such as chemotherapy/immunotherapy. Clinicians often tend to use the generic diagnosis of OSSN because of the inherent difficulty in clearly differentiating dysplasia, carcinoma in situ, and SCC based solely on clinical features. There are some new data that may help. In their extensive analysis, Shields et al. identified SCC to have diffuse involvement, location >1 mm from the limbus, brown pigmentation, greater median basal diameter and thickness, and presence of intrinsic vessels. In order, the greatest relative risk for SCC versus CIN included diffuse configuration (1.6), brown pigmentation (1.6), >10 mm median basal diameter (1.3), and >1 mm thickness (1.3). Interpretation of these data reveals that an epithelial tumor diffusely infiltrating the surface of the eye, measuring >10 mm in diameter and 1 mm in thickness, and with regions of pigmentation, carries 4.33 greater chance to represent SCC rather than CIN. However, it is important to understand that the features mentioned are only predictive and not confirmatory, and in a given case, dysplasia, carcinoma in situ, and SCC may all coexist, as they often do. After all, dysplasia, carcinoma in situ, and SCC are a clinical continuum with a strong evolutionary basis. It is recommended that the clinicians should continue to use the generic term OSSN in their clinical diagnosis while carefully looking for clues to try and learn to clinically differentiate CIN and SCC from each other. Routine use of high-resolution anterior-segment-optical coherence tomography (AS-OCT) and clinical correlation may be educative. This process may help triage cases for primary surgery versus primary topical chemotherapy/immunotherapy based on these clinical clues. This issue of IJO carries an article on the treatment outcome of OSSN with emphasis on topical chemotherapy/immunotherapy. Tumors were staged using AJCC 7 by the authors without histopathologic information in patients who underwent conservative treatment and T3 was the major subgroup where topical chemotherapy/immunotherapy was used. There was about 85% local tumor control with topical interferon, perilesional interferon, and mitomycin C. It should be noted that the follow-up was relatively short (6 months) in this subgroup. Although this is interesting preliminary information, reader should not carry the impression that topical chemotherapy/immunotherapy is the current standard of care for T3 tumors based on this data. A very careful clinical evaluation and assessment of suitability of each patient for topical chemotherapy/immunotherapy are mandatory. While the expected response to primary topical chemotherapy/immunotherapy would be excellent for dysplasia and carcinoma in situ, it may be useful as neoadjuvant chemoreduction/immunoreduction for SCC (necessitating surgical excision of the residual tumor if any). Topical chemotherapy is best avoided if the corneal stroma or sclera are involved. Surgical management should be guided strictly by standard protocols in all cases – excision with 4-mm clinically clear margins (determined by slit-lamp evaluation and Rose Bengal stain), alcohol-assisted keratoepitheliectomy for the corneal epithelial component, lamellar keratectomy and/or lamellar sclerectomy as necessary (depending on the tumor base judged by clinical evaluation and aided by high-resolution AS-OCT and intraoperative clues), and excision edge double-freeze-thaw cryotherapy. There should be no compromise in the surgical protocol as even an invasive SCC can clinically mimic dysplasia or carcinoma in situ. Patients with corneal stromal invasion or scleral infiltration would benefit by excision with lamellar dissection, followed by plaque brachytherapy to the tumor base. The clinician should be very careful in interpreting the histopathology report and understanding the implications of differentiating dysplasia, carcinoma in situ, and SCC to prognosticate local tumor recurrence and metastasis. Accurate interpretation of histopathology is useful to plan further treatment when the excision margin and base are reported positive for tumor cells. If the excision edge is positive with only dysplasia or carcinoma in situ and excision edge cryotherapy has already been performed as part of primary surgery, then observation or adjuvant topical chemotherapy/immunotherapy may be justified, while excision edge positivity with SCC would mandate re-excision. Excision base positivity with SCC would need adjuvant plaque brachytherapy. Oversimplification of diagnosis and staging and popularization of seemingly easier treatment strategies can lead to inappropriate case selection and suboptimal management. Just as the use of anti-vascular endothelial growth factor agents has brought in a renewed interest in medical retina, popularization of topical chemotherapy/immunotherapy in OSSN has widened the treatment net. While it is important for the patient to have easy access to treatment, it is mandatory that the treating clinician understands the science behind the decisions governing the management strategy in depth and appropriately triages the patient. After all, if poorly managed, even a potentially easily curable cancer such as OSSN can progress to cause loss of vision, loss of the eye, and tumor-related mortality. Margo CE, White AA. Ocular surface squamous neoplasia: Terminology that is conceptually friendly but clinically perilous. Eye (Lond) 2014;28:507-9. Amin MB, Edge SB, Greene FL, Schilsky RL, Gaspar LE, Washington MK, et al., editors. AJCC Cancer Staging Manual. 8th ed.. New York: Springer; 2017. Shields CL, Alset AE, Boal NS, Casey MG, Knapp AN, Sugarman JA, et al. Conjunctival tumors in 5002 cases. Comparative analysis of benign versus malignant counterparts. The 2016 James D. Allen Lecture. Am J Ophthalmol 2017;173:106-33. Meel R, Dhiman R, Vanathi M, Pushker N, Tandon R, Devi S. Clinicodemographic profile and treatment outcome in patients of ocular surface squamous neoplasia. Indian J Ophthalmol 2017;65:936-41.